The No-Chemical, No-Poison Answer to Your Mosquito Problem! Are those pesky mosquitoes keeping you from enjoying your backyard? Using the power of garlic, Weed Pro covers your lawn, fences and trees with a fine garlic mist blown into every nook and cranny those mosquitoes can hide in. Garlic has a natural sulfur which repels mosquitoes and therefore drastically reduces the amount of mosquitoes in your yard. Since mosquitoes are soft-bodied insects the garlic juice can be very toxic to them in increased concentrations. The juice does not harm humans, pets or plants, but to mosquitoes it can be deadly. The odor of garlic chases them away for as long as they can detect the odor. The odor of misted garlic juice becomes undetectable to humans within a couple of hours, but mosquitoes can detect the odor as much as 10,000 times better than a human. So even though you can’t smell the garlic, they can and the majority of them will stay away from the sprayed area for up to one month depending on the weather. If the mosquitoes aren’t in your yard, they can’t get into your house either! Great for backyard barbeques, kids enjoying the yard without being covered with bites, or other special outdoor events. Depending on the season, 4-5 applications will keep the mosquitoes at bay all season long. 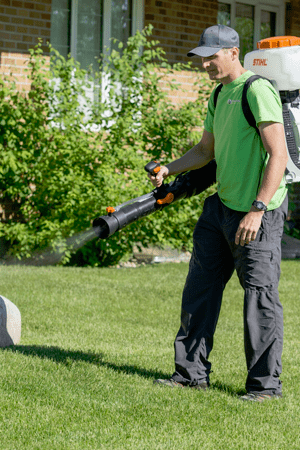 Weed Pro offers one time applications of our mosquito control or we offer a Mosquito Program that will keep those mosquitoes away all summer long with regular visits every three to four weeks. Keeping the yard free of Mosquito's all season.